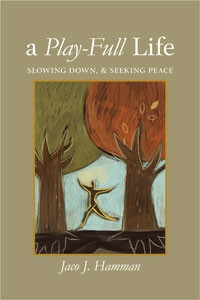 A Play-full Life is a book for every person who seeks emotional, relational, and spiritual balance in life. In 1935 the British developmental theorist, Ian Suttie wrote: “Necessity is not the mother of invention; play is,” reframing a statement ascribed to Plato. Today, we’re rediscovering the power of play as a way of living. For us as persons of faith, play is a sign of God’s reign (Isaiah 11:6-8 and Zacharia 8:4-5). It is a symbol of God’s grace and arguably one of the most transformative and and foundational experiences we can participate in, irrespective of one’s age. When we enter into relationships with self, other, and God, when we experience wonder or practice religious rituals, or when we participate in the arts, games, sports and movies or just seeking fun, play prepared the way to those moments. Furthermore, play teaches us the very traits we need to navigate life, such as entering into relationships, dealing with difference, problem-solving skill and how to be less violent. I smelled God. Maybe you have, too. It happened in northern Montana as I was making my way along forest and fire roads on my off-road motorcycle with my riding partner, Barry. We were nearly two thousand miles into our journey already, having left Michigan a few days earlier, but only on Day One of “our ride,” and not knowing what the next 2500 miles would bring as we set our sights on the Mexican border crossing of Antelope Wells, New Mexico. We were on the Continental Divide Trail that follows the Rocky Mountains from Canada all the way south into Mexico. Somewhere I missed a turn and we were lost–again. It had not taken us long to realize that getting lost was going to be an integral experience of this journey. Asking for directions can be freeing and soon we were headed back into the Rockies under deep purple clouds. We stopped to don our raingear just as a torrential storm exploded above and around us. Even with our off-road motorcycles, traveling on gravel in these circumstances is dangerous, so we stopped and took shelter beneath some trees, reckoning on there being taller trees in the area for lightning to strike. A herd of deer nervously crossed the road a few yards from us, sniffing the air as if they knew something we didn’t. The storm blew over in about fifteen minutes and blue sky appeared. It was then that I smelled God. It was an intense smell that filled not only my nose and lungs but also every fiber of my being. I hadn’t known: God smells like a pine forest freshly washed by a torrential thunderstorm. Not worrying excessively when one gets lost and smelling God are both normal experiences if one lives a play-full life. How spiritual and life-giving it is to discover life and nature and God beyond any knowledge or past experience one might have! Smell is a powerful sense that awakens one’s spirit and creates new memories just as one can feel particularly alive in a moment of significant adversity. A Play-full Life is available from Amazon.com.